We think it's a bug in AVFoundation. Reboot your Mac as a workaround. Use iShowU HD/HD Pro 2.3.7+ and iShowU v1 1.92.7 - these builds contain a check for this condition and will warn at the beginning of a recording. We as yet we have been unable to pin down the cause of the fault. We think it's a bug in AVFoundation, but cannot prove or disprove it. What we do know is that if you reboot, the problem is solved. This leads us to believe it's a resource usage issue within the OS (our leak analysis shows that we are not leaking frames). 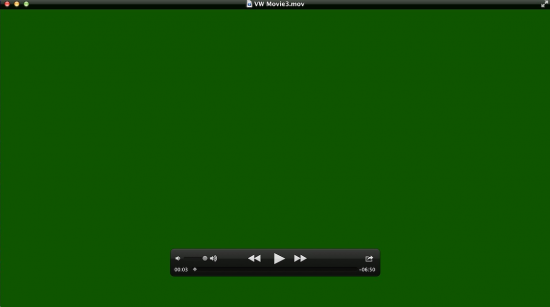 As of iShowU HD 2.3.7 and iShowU v1 1.92.7 we check for these bad frames and warn you. The checking occurs during the first 500 frames recorded, so if you did end up recording a full screen of 'green' at some point, that won't stop the recording later on. Another thing you can do, if you're using iShowU HD/HD Pro is enable the preview. If this condition is in effect, the preview will be green as well.